BeltLine Rail Progress Update — BeltLine Rail Now! Rail on the BeltLine is vital to provide Atlantans alternatives to using a car on our over crowded roads to jobs, education, healthcare, parks, recreation, groceries, arts, restaurants, and stores. Without rail, further development on the BeltLine will turn people away because our roads are too crowded. Luckily, we are closer to rail around the entire BeltLine than ever before. Five steps must be taken before rail construction can begin: right of way, planning, design, environmental, engineering, and funding. These five steps are complete or almost complete for all 22 miles of light rail. This blog is an overview of where we are today after the More MARTA funding. Local costs are using More MARTA’s technical analysis. These costs assume federal construction matching an 30 years of operations and maintenance. 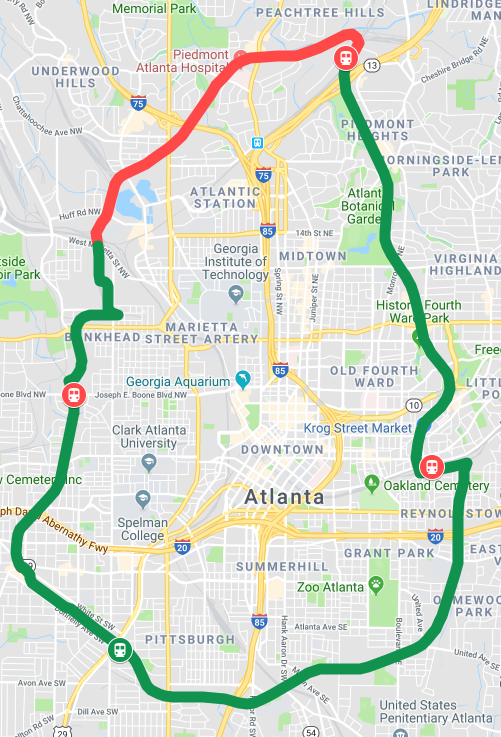 Rail around the entire BeltLine is the most “shovel ready” project in Atlanta. We are missing $710.9M to complete the entire BeltLine with four vital infill stations. We are closer than we have ever been before to complete rail on the BeltLine by 2030! 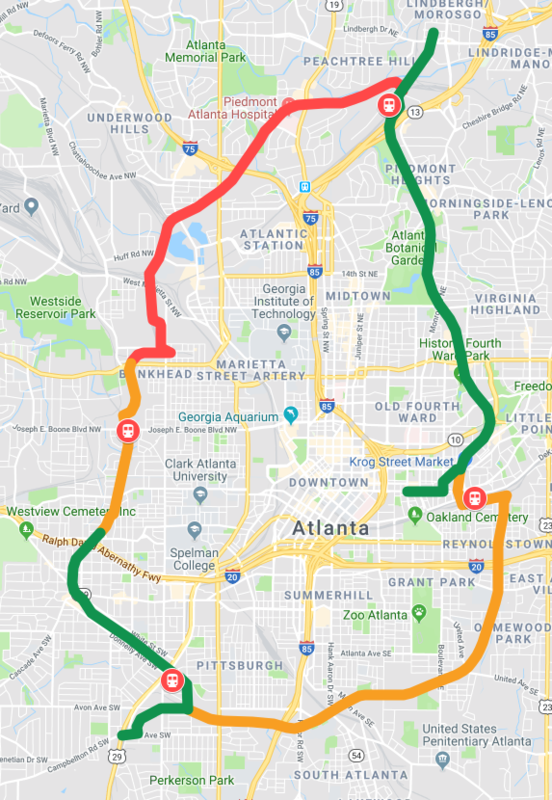 Four groups are essential to rail around the entire BeltLine by 2030: Atlanta City council, MARTA, the Atlanta Regional Commission, and the Atlanta Beltline Inc. We need champions in each group to guide the BeltLine rail through its final funding and prioritization. These champions must make sure every section of BeltLine rail is on all the right lists and prioritized at the top. These lists include MARTA’s recommendation to ARC and ARC’s TIP (6 year plan) and Capital RTP (25 year plan). Our champions need to block the things that will delay or stop the BeltLine completely. Things like stopping developers from building where the BeltLine is supposed to go. The Atlanta BeltLine has acquired almost all of the land necessary for the BeltLine. Armour Station presents an exciting opportunity for a major new regional transportation center at the north end of the BeltLine. The City of Atlanta owns some but not all the land necessary for the Armour Infill Station. It is rumored the rest of the land needed will be for sale in 2019. Hulsey Yard is rumored to be for sale in 2019. The possible new infill station between King Memorial and Inman Park to serve the BeltLine connection. A new infill station would also serve the Hulsey Yard area, which will eventually be redeveloped. The BeltLine is in talks with land owners for the 0.3 miles of BeltLine north of Washington Park. The BeltLine is in talks with friendly developers for an easement for 0.45 miles along the NorthWest BeltLine Connector. The BeltLine is in talks with CSX for 4 miles along the Northwest BeltLine. This active rail is owned by CSX which runs roughly 6 to 10 trains a day. The easement talks between the Atlanta Beltline and CSX include environmental and engineering studies. Planning is complete for all sections of the BeltLine except for the 4 miles of the Northwest corridor intended to be shared with CSX. Planning has also not begun for the Armour, Hulsey, or Boone infill stations. Design is complete for the northeast and southwest segments of the BeltLine. This includes the rail south of Hulsey to Glenwood Ave SE. The southeast rail design is “80%” complete. The design for the 2.2 miles of rail north of Washington Park on the west side is also in progress. Design has not yet begun on the 4 miles of shared rail with CSX or the Armour, Hulsey, Boone, or Murphy Crossing infill stations. Environmental and engineering studies are complete for the northeast and southwest segments of the BeltLine. They are in progress for all remaining segments of the BeltLine including the Northwest segment shared with CSX which is necessary to complete the easement. These studies have not yet begun for the Armour, Hulsey, Boone, or Murphy Crossing infill stations. Funding is complete for the northeast and southwest segments of the BeltLine. The connection between the Northeast and Southwest segments as well as the extension on the west side up to Bankhead station are partially funded. Armour, Hulsey, Boone, and Murphy Crossing infill stations are not funded.